Gastric ulcer, also known as a peptic ulcer or peptic ulcer disease (PUD) is the ulceration of an area of the gastrointestinal tract. It is usually acidic, therefore can be very painful. A great proportion (70 – 90 percent) of gastric ulcer cases are associated with Helicobacter Pylori, a bacterium that lives in the acidic environment of the stomach. Ulcers can be caused or worsened by certain drugs such as aspirin, ibuprofen or other NSAIDs, while roughly four percent of gastric ulcers are caused by a malignant tumor. A gastric ulcer typically occurs when stomach acids injure the stomach’s lining of protective mucus. The gastric ulcer is generally defined as mucosal erosions equal to or greater than 0.5 cm. The two most common causes of developing a gastric ulcer are Helicobacter Pylori (H. pylori) and NSAIDs. The Helocobacter pylori bacterium weakens the protective lining around the stomach, thus making the underlying tissues more prone to damage by digestive juices such as stomach acid. As a result, the walls of the stomach develop a chronic inflammation (gastritis), which can evolve into a gastric ulcer. H. pylori is a common bacterium present in the stomach of roughly half the world’s population, but it is not always active. Most people carrying the Helicobacter pylori bacterium do not develop gastric ulcers. Once infected, however, the infection cannot be eliminated. It can be managed and treated, but it stays in the stomach for the rest of your life. Nonsteroidal anti-inflammatory drugs (NSAIDs), meanwhile, are responsible for the wide majority of gastric ulcer cases not caused by H. pylori. These drugs are very common and widely used, especially since they are available without a prescription (over-the-counter NSAIDs), but in time they irritate the lining of the stomach and allow the acids to cause an ulcer. Some of the most common NSAIDs include ibuprofen, aspirin and diclofenac. There are several genetic and environmental factors that may influence the course of gastric ulcer. Smoking and excessive alcohol intake are particularly dangerous risk factors. Psychological stress and dietary habits do not cause gastric ulcer by themselves, but they can make it worse. Excessive alcohol intake can erode the mucous lining of the stomach, thus stimulating the production of stomach acid and leading to an ulcer. Some studies found links between smoking and ulcer formation, while others found that smoking by itself may not be a severe risk factor for developing gastric ulcer unless it is associated with Helicobacter pylori infection. Unhealthy diets and spice consumption were considered ulcerogens until late in the 20th century, but eventually they proved of little importance in the development of gastric ulcer. Caffeine and coffee were also hypothesized as exacerbating ulcers, but studies found the don’t affect ulcers to any significant extent. The best way to prevent developing gastric ulcer or, if too late, manage the disease is to stop smoking, avoid NSAIDs as much as possible, avoid alcohol or at least reduce alcohol consumption, and reduce stress to a minimum. Most ulcers, however, heal with proper medication even in patients who lead a stressful life. An endoscopy is the most common form of diagnosing gastric ulcer. An endoscopy consists of a small flexible tube with a tiny camera at the end. This tube is passed through the mouth (the patient has to swallow it) to examine the lining of the stomach and duodenum. The procedure is not painful, but it may cause some discomfort. Tissues may be harvested for examination. Testing for Helocobacter pylori infection can be done through a blood trst, sample of feces, or biopsy sample. Biopsy is usually required to rule out cancer. In most cases, an ulcer can heal completely with proper medication. Treatment usually involves an acid suppressing medication that will reduce the amount of acid the stomach produces. Such treatments should typically be kept for up to four or six weeks, until the ulcer completely heals. Gastric ulcer medications are broadly classified into two categories: proton pump inhibitors and H2 blockers. Proton pump inhibitors are the most potent and therefore most recommended, while H2 blockers are less potent but can prove equally effective. H2 blockers work by reducing acid production and inflammation until the ulcer is healed. When Helicobacter pylori is the cause of the gastric ulcer, as in 70 – 90 percent of all cases, antibiotics are often prescribed to clear the infection. As previously mentioned, the H. pylory bacterium cannot be eliminated from the stomach, but antibiotics can control it and minimize its harmful effects. If the gastric ulcer occurs from the use of NSAIDs, however, one should immediately stop using such over-the-counter drugs. Surgery is only necessary if complications occur. If left untreated, gastric ulcer can lead to a variety of complications, including bleeding, perforation of the stomach, obstruction and, in severe cases, it can be fatal. Bleeding – an untreated gastric ulcer can damage the blood vessels in the lining of the stomach, leading to bleeding. Such bleeding can range from minor to life-threatening. Symptoms of stomah bleeding include blood in the stool, weakness, and vomiting blood. If any of these symptoms occur, medical assistance should be requested immediately. Perforation – untreated gastric ulcer can lead to a hole through the stomach wall, which can allow acid and food to leak into the abdominal cavity. If this occurs, the abdominal cavity becomes infected, causing sudden and extreme abdominal pain. Such cases typically require urgent surgery. Obstruction – Gastric ulcers can also cause scarring, which in turn can prevent the transit of food from the stomach, causing abdominal pain and/ or vomiting. Gastric ulcer is treatable and can heal completely with proper medication and adequate changes in lifestyle, but it can be dangerous if left untreated. Roughly four million people in the U.S. have active peptic ulcers, and roughly 350,000 new cases are diagnosed each year. 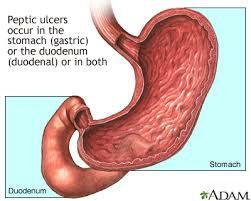 Duodenal cancers are four times more prevalent than gastric ulcers. In the United States, an estimated 3,000 deaths per year are caused by duodenal cancer and 3,000 by gastric cancer.